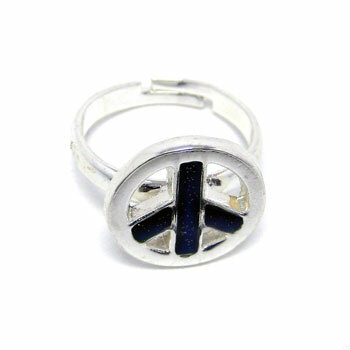 Mood ring with a peace sign design. 1 inch by 1 1/2 inches. Adjustable. 36 rings per card. Sold by the card. $53.00 per box (36 pieces). $34.65 per box for 4 boxes or more. $29.80 per box for 8 boxes or more.